Consistent with the original conception of the building, the public areas of the building were to make up a “museum of discovery and progress,” as a 1923 prospectus drawn up by the Academy' Committee on Exhibits called it. Exhibits were to show the results of research going back no more than two years and were to be put on display in and around the Great Hall, where the public could view them. Seven rooms surrounding the Great Hall displayed scientific research undertaken by government, industry and university laboratories. The East Gallery, one of two galleries flanking the Great Hall, is shown prior to WWII. NAS Archives. These exhibits proved to be popular, so much so that more than 30,000 people were reported to have visited the building the first year it was open, a number that nearly doubled by the year 1937.15 The exhibits continued to draw visitors until the prospect of American involvement in the World War II brought with it an expansion in the demand for the Academy's services and for the increased office space these new activities required. 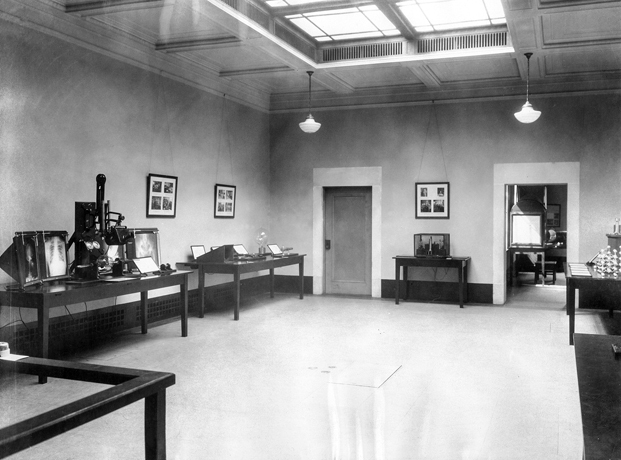 The exhibition rooms were converted to office spaces, and the exhibits were discontinued. Although the war ended in 1945, the old exhibition rooms continued to be used as offices for staff and officers until the building' restoration, completed in 2012. Today, the restored East Gallery features the work and history of the National Academy of Sciences and the restored West Gallery features rotating exhibits that explore the relationship between art, science, and culture. The Marian Koshland Science Museum of the NAS, located on 6th Street in Penn Quarter near Judiciary Square, features topical exhibits on the current work of the nation' scientists.